Each evening, after I kiss Craig goodnight, I reach for my phone. I close each day by looking through my Instagram feed. I scroll through so much loveliness… gorgeous babies, smiling kids, fantastic meals, memories captured. So many small moments… common threads that connect us all. That’s what Instagram is for me… a way to witness the small moments of others and share my own. Sometimes I get lost scrolling back through my own Instagram photos. All it takes to bring a memory flooding back is a glimpse of a small moment that I’ve been blessed with. Instagram is, for me, like the photo albums I grew up with. Between those covers, my mother tucked away the things she hoped to remember… the things she hoped I would remember. Life at its loveliest. But those moments can sometimes get lost in the shuffle. 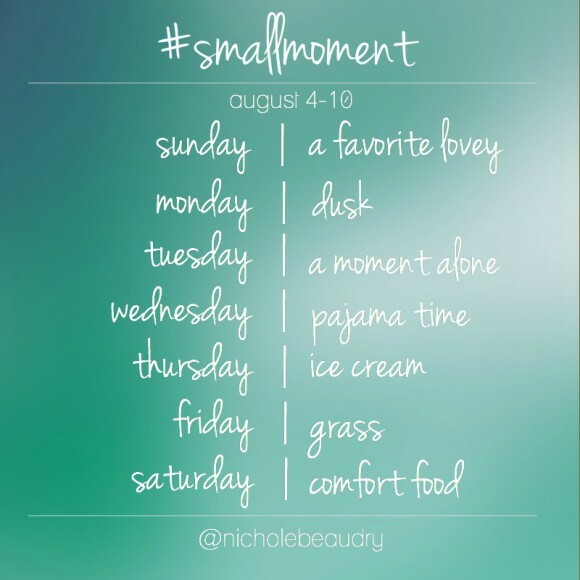 So, I’d love it if you joined me each week as to look for and celebrate the tiniest memories that we’re all making every day. Each week, I’ll share a week’s worth of prompts to get us thinking and I’d love it if you played along! Please use the words as a launching point and interpret them in a way that’s meaningful to you. Simply tag your photo with #smallmoment so we can find each other’s photos easily. If a word brings to mind a photo you’ve taken in the past, feel free to dig through your archives and tag it. Please take a few moments to take a peek at and give some love to the small moments others are sharing, too. The more friends you can get to play along, the more fun this will be. So, by all means, please pin, tweet and share on Facebook! Here’s where you’ll find me: NicholeBeaudry … come follow me and I’ll follow you. I can’t wait to see you over on Instagram beginning this Sunday!